There is often talk about glucosamine supplements in the Tripawds Discussion Forums. Syn-flex liquid glucosamine for pets was our choice for Jerry. As one of his daily supplements, we believe it helped with his orthopedic issues. At eight years old – and being a Shepherd mix with mild displaysia – we started him on Syn-flex shortly after the amputation of his front left leg. Hip and joint pain never slowed him down! 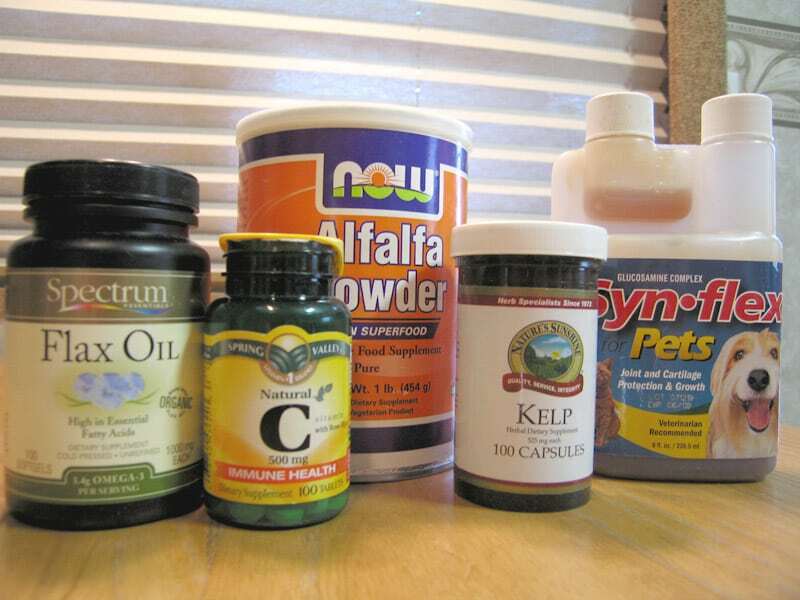 Syn-flex is an all-natural product that is not known to interact with any drugs or medications. It is a premium glucosamine arthritis liquid supplement made in the USA since 1999. The formula for pets is identical to that for humans but includes a tasty beef flavor. Syn-flex uses only pharmaceutical quality liquid Glucosamine, the highest quality available. It has no fillers like many Glucosamine pills, and as a liquid it delivers maximum absorption and rapid pain relief. Syn-flex has no dangerous side effects such as those associated with many NSAIDs and Cox-2 Inhibitors. * Please note that “Shark Cartilage” is not actually derived from shark fins. It is merely an industry term for shellfish exoskeleton. We know – we were concerned, so we asked when visiting the Syn-flex factory in Florida. Visit their website for specific details about all Syn-flex ingredients. Our 12-year old min-schnauzer was having a real hard time walking and trying to go up and down our steps to go outside. The vet gave him an arthritis medication but I was reluctant to use it. I checked all the information and testimonials on Syn-flex and decided to give it a try. It seemed to work within 2-3 days with our Bunky. Where he could barely walk before, he was almost running with the other younger dogs within a week. At the same time I was using the product for my arthritis in my knee and felt a huge improvement immediately. When we ran out of the product I didn’t re-order, thinking I could some like products from the pet stores. No way did they work the same. I just received my first re-order of Syn-flex, Bunky has taken 3 doses and is again his lively, playful self that he was before when he took it. THANK YOU for this wonderful product! Free shipping in U.S.! Money Back Guarantee! And for you humans out there … the fine folks at Syn-Flex now produce a super-healthy Acai berry juice. Viva Acai™ is formulated using pomegranate and Acai Berry, a fruit found in the Amazon rainforest. It is now hailed as the #1 “superfruit” in the world for powerful antioxidant and nutritional properties. Find out more from Syn-Flex.